Hello everyone!! 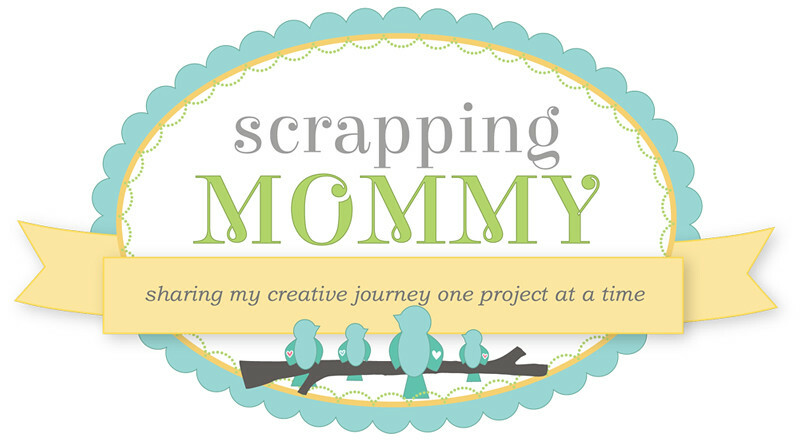 I am sharing a project I made for the Jinger Adams' Design Team Call. 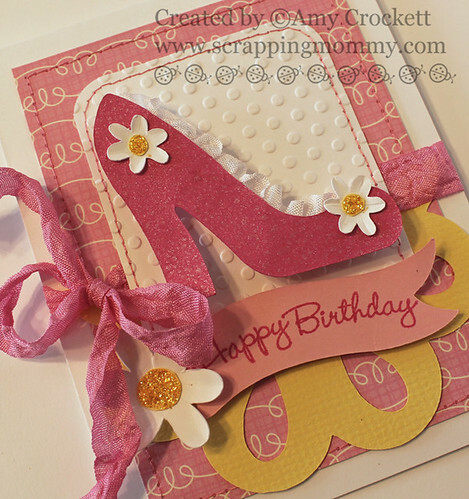 I know that she loves shoes and I saw the adorable 3-d shoe on the Princess Party cartridge and knew that I wanted to make one with a matching card to go with it for the design team application. I sprayed both the 3D shoe and the one on the card with some Tattered Angels Glimmer Mist to add some shine. I used my sewing machine and some pink thread to sew on the card. The banner is cut from the Craft Room Exclusive Banner cartridge and the yellow scallop is from Elegant Edges. I used Card Patterns Sketch 158 as a layout for my card. 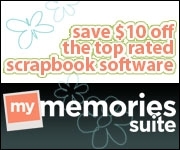 The sentiment is from the Gift Card Sentiments at My Creative Time. I just love how easy it is to manipulate the clear stamps to bend and curve like the banner. I made the crinkle ribbon from some white seam binding and the Tattered Angels Glimmer Mist. 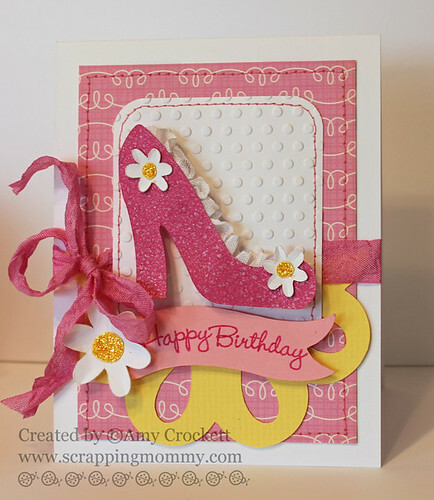 The embossing is done with my Cuttlebug and the Polka Dots embossing folder. The patterned paper is from Echo Park. 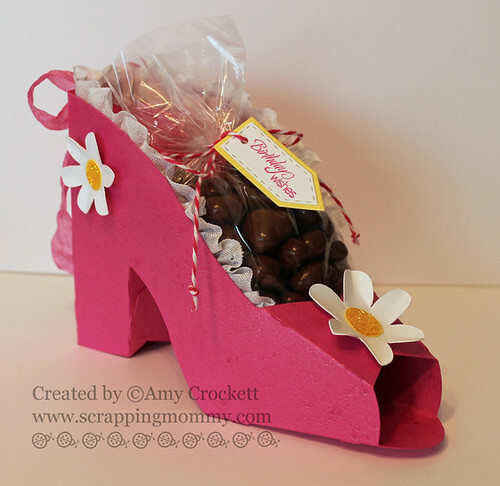 I added some chocolate covered raisins to the inside of the shoe as a little treat for the recipient. I tied off the goodie bag with some Pink Sorbet bakers twine from The Twinery. I added some white crinkle ribbon to the edges of the shoe for a little flair. The tag and sentiment are from the Teeny Tag Greetings at My Creative Time. To the center of the flowers I have added some Stickles Glitter Glue and then tied a bow with some more of the pink crinkle ribbon and added it to the back of the shoe with a button. Well, I hope that you have enjoyed my project today. 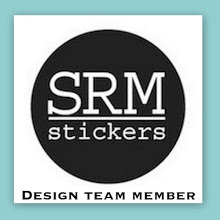 There is still a little bit of time left to get your applications in for the design team call. I think it closes tomorrow night. 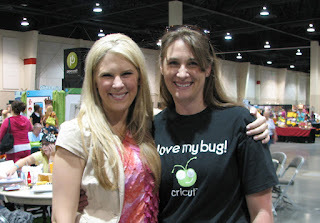 I wanted to finish off by sharing a picture from the first time I met Jinger at the Scrapbook USA Expo a couple of years ago. She really is super sweet!! 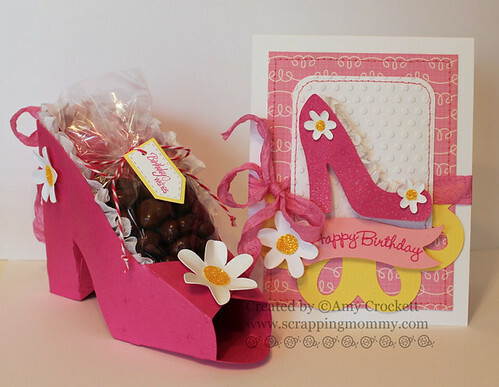 Beautiful shoe and matching card! Good luck with the dt call! Wish "shoe" luck! Great projects! Super project, Amy!!! You really put alot of detail into it!!! Looks fantastic!!! Wow, awesome projects! The shoe is so cool and the card is stunning. Thank you for playing along at Card Patterns! I LOVE THIS!!! GOOD LUCK!! Wow Amy!!! That is spectacular!! You are so talented! :) I love everything about this! Congrats on being chosen for Jinger's design team. 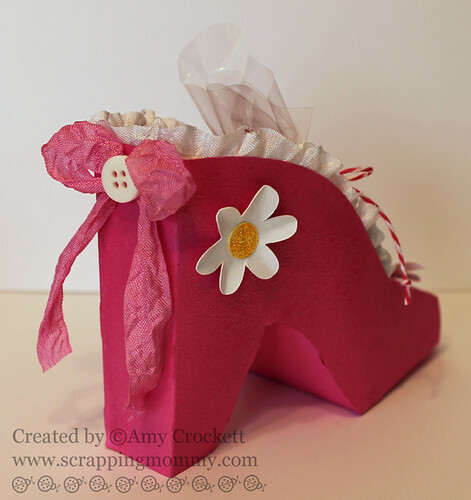 I love your shoe and I am featuring this post as part of my Fab Five Friday post.